Many Americans were and are torn in their view of General Robert E. Lee (1807-1870), the famed Confederate Army commander. Today, with the radical left demanding the removal or destruction of any political or military leaders of the Confederacy, Robert E. Lee is in the crosshairs. He has been applauded for his gentlemanly demeanor and shrewd military expertise; he stands in the American military pantheon alongside Washington, Jackson, Grant, MacArthur, Eisenhower, Patton, and Powell. Yet there is an obvious difference between all these men and Robert E. Lee, for Lee not only fought for the American flag, he also fought against it. Robert E. Lee was, by traditional definitions of the term, a traitor. Robert Edward Lee was born in Virginia in 1807, the son a Revolutionary War hero. Married to a great-grand daughter of Martha Washington, he belonged to the elite of Virginia planter society. An inheritor of the South’s famed martial spirit, Lee graduated from West Point Military Academy in 1829. He built dams and dikes along the upper Mississippi with the Army Engineers, and later served as a cavalry officer on the Texas frontier. He was tested in battle in the Mexican War, and had attained the rank of Army Lieutenant Colonel when he rousted John Brown and his men from Harper’s Ferry in 1859. At the outbreak of the Civil War, Abraham Lincoln quite naturally offered Lee a command in the Union army, but the Virginian turned him down. He betrayed his oath of office in order to follow what he honestly believed to be a more important obligation—his duty to defend his native Virginia. He saw himself as a Virginian first and an American second. As such, he brilliantly led Confederate troops through three long years of war. The Constitution of the United States defines as a treasonable offense any “act of war” against the United States or any “aid and comfort” given to enemies of the United States. Certainly, the Confederate States of America, through secession, had left the United States and become the Union’s enemy. Yet, as noted, Abraham Lincoln always contended the South had really never left the Union and could not legally do so. At war’s end, there were no “treason trials” of former Confederates leaders, and, although the 14th amendment to the Constitution stripped former Confederates of their vote and citizenship, those who lived into the 1880s and 1890s saw all of those rights thoroughly restored. 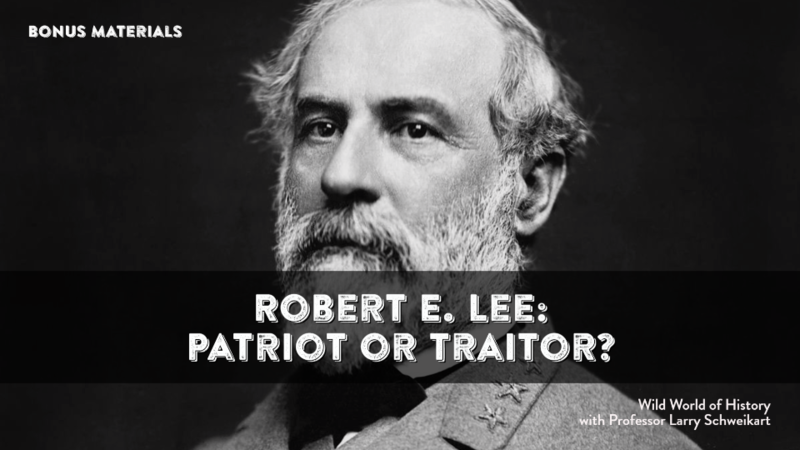 Was Robert E. Lee a “traitor”? A number of Americans would, with some reluctance, stop short of that pronouncement. In their love and respect for Lee and their reluctance to brand him a traitor, some Americans have made Jefferson Davis the scapegoat for southern separatism. Davis is branded the “traitor” to his country while Lee is revered as a southern gentleman who gave his all to the “Lost Cause” of the Confederate States of America. Certainly, Lee and Davis (alongside many others) were both technically traitors to the Union they had sworn to defend—and they both defended Southerners’ “right” to enslave millions of their fellow human beings. Yet there was a difference between Lee and Davis, and it can be seen in how each exited the Civil War. At war’s end, Jefferson Davis did not surrender; he fled South, trying to rally the Confederacy to fight on and perhaps form a government in exile. He was arrested, imprisoned for two years, and then released without further punishment. He retired to a fine home on Mississippi’s Gulf Coast, writing his memoirs and defending his secessionist views and actions to the very end. Near Appomattox Court House on April 9, 1865, Robert E. Lee knew he was beaten. Urged by a fellow officer to take to the mountains and lead a guerilla war against the Yankees, Lee refused. He retorted that further resistance was futile and would only bring more bloodshed and a “state of affairs it would take the country years to recover from.” “There is nothing for me to do but go and see General Grant,” he concluded, “and I would rather die a thousand deaths.” He met and surrendered to Grant, and ordered all of his men to do the same. After Lee departed Appomattox Courthouse, Grant sternly told his own troops, “the rebels are our countrymen again.” General Robert E. Lee was not charged with treason and he spent no time in jail. During the brief five years that he lived following the Civil War, Robert E. Lee became the president of Washington College (now Washington and Lee) in Virginia. Interestingly, whenever Lee marched the Washington College military cadets onto and off the campus parade grounds, he declined to march in step with his “troops.” He died on October 12, 1870, respected in the North for his character and beloved in the South for his fighting ability. James MacPherson, Ordeal By Fire: The Civil War and Reconstruction (New York: McGraw-Hill, 2001), 519-20.